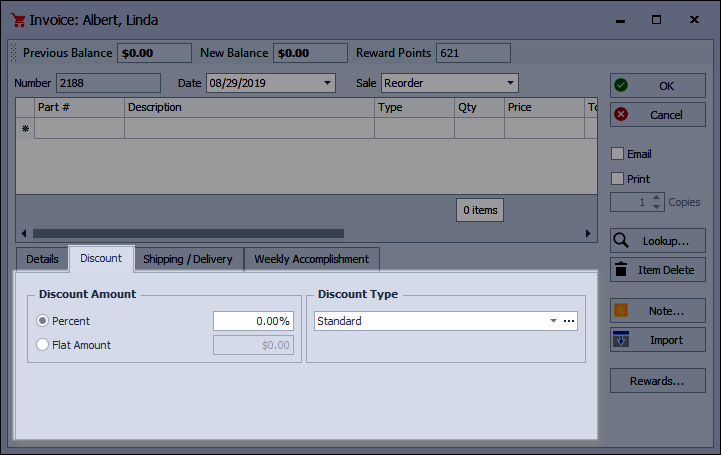 Use the options in this tab if applying a discount to the entire invoice, rather than to individual items. Select this option to apply a percentage discount to the entire invoice total. If the contact has a default discount saved on their profile the percentage will appear automatically in this field. Select this option to apply a flat dollar discount to the entire invoice total. Please Note: Flat amounts cannot be combined with any other discounts. Pick one of the options in this list to identify the type of discount being applied to the whole invoice (Default is set to Standard Discount). Click the button to add, edit, or delete a custom discount type.